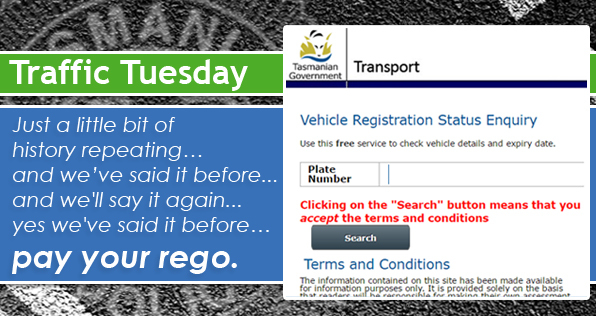 Just a little bit of history repeating… and we’ve said it before, and we’ll say it again, yes we’ve said it before… pay your rego. Vehicle registration is mandatory and there’s no grace period for driving an unregistered vehicle. This page -- https://www.police.tas.gov.au/what-we-do/traffic-policing/traffic-tuesday/20-rego-reminder/ -- was last published on June 27, 2017 by the Department of Police, Fire and Emergency Management.